Vancouver, British Columbia, Canada. August 3, 2011. Columbus Gold Corporation (CGT: TSX-V) ("Columbus Gold") is pleased to provide Phase I drilling results by JV partner, Navaho Gold PTY Ltd ("Navaho Gold"), at Columbus Gold's Stevens Basin project located in Nevada, USA. Navaho Gold can earn an initial 51% interest in Stevens Basin over a 3 year period by incurring exploration expenditures of $3 million and making cash and share payments to Columbus Gold. Assay results have been received from 2,390 meters (7,840 ft) of drilling in 14 reverse circulation drill holes completed by Navaho Gold during May and June 2011. The majority of the drilling was designed to test soil and rock chip gold geochemical anomalism (defined by work previously conducted by Columbus Gold as shown in map at link below) and was integrated with geophysical data (ground gravity and airborne magnetic data) acquired by Navaho Gold to select drill sites. Three sites (holes SB11-09, 10 and 13) were selected in areas of no outcrop on inferred structural features alone. Stevens Basin is an unusual gravel-filled semi-circular basin, approximately 10-13 km2 in area. Surrounding this basin are hills of Paleozoic sedimentary rocks which, along its northern margin, consist of mainly Devonian age limestone containing areas of altered and mineralized intrusive rock and siltstone float. In the area where the drilling was conducted the target horizon is a calcareous siltstone unit inferred to dip off the outcropping limestone out under the gravel cover. Based on the conventional model for Carlin-style deposits, mineralization is expected to be best developed where the prospective host unit intersects controlling structures capable of introducing the mineralizing fluids. Mineralization in these 3 holes is hosted within oxidized, sheared and variably fractured/brecciated limestone with extensive calcite veining and jasperoid development (decalcification and silicification - usually associated with a Carlin-style gold mineralized system). All 14 holes returned intercepts containing anomalous (> 10ppb or 0.010g/t) values of gold. Of particular importance is the thickness of the anomalous gold interval in SB11-09 (109.7m from 1.5m depth) which indicates a significant gold-bearing hydrothermal system has been identified. In addition to the elevated gold intercepts several holes encountered zones of anomalous arsenic (up to 0.15% As over 9.1m in SB11-05; 0.13% As over 36.6m in SB11-012), anomalous zinc (2.03% Zn over 7.6m in SB11-11), anomalous barium (0.47% Ba over 87m in SB11-11; 0.84% Ba over 6.1m in SB11-05; 0.77% Ba over 7.6m in SB11-10) and thallium (2.4ppm Tl over 12.2m in SB11-05; 1.5ppm Tl over 74.7m in SB11-09; 3ppm Tl over 7.6m in SB11-10; 1.5ppm Tl over 83.8m in SB11-13). These elements are all strong indicators of a Carlin-style system. At Barrick Gold Corp's Archimedes/Ruby Hill gold mine, located in a similar structural setting, 9km to the northeast of Stevens Basin, the gold mineralization has an association with elevated base-metals (zinc in particular) and barite-rich hydrothermal breccias. The Archimedes deposit also occurs in close proximity to a Cretaceous intrusive stock and, given the elevated zinc returned from Navaho Gold's hole SB11-11 at Stevens Basin, widespread Ba anomalism and the possible existence of an intrusive body in the central portion of Stevens Basin as inferred from the airborne magnetic data, Navaho Gold believes that the drill results to date at Stevens Basin could indicate an analogous mineralized setting to the Archimedes/Ruby Hill deposit. Commenting on the results, Navaho Gold's CEO, Mr. Mark Dugmore remarked that "the results from the first pass drilling at Stevens Basin are considered to be very encouraging in the context of exploring for Carlin-style mineralization. They are typical in terms of gold grade and pathfinder element association of leakage haloes peripheral to and above known deposits close by. The results warrant further follow-up drilling in an attempt to focus our effort toward higher grade mineralization." Navaho Gold plans to complete a further phase of drilling at Stevens Basin during Q3, 2011 with the objective of targeting additional geochemical and structural features. 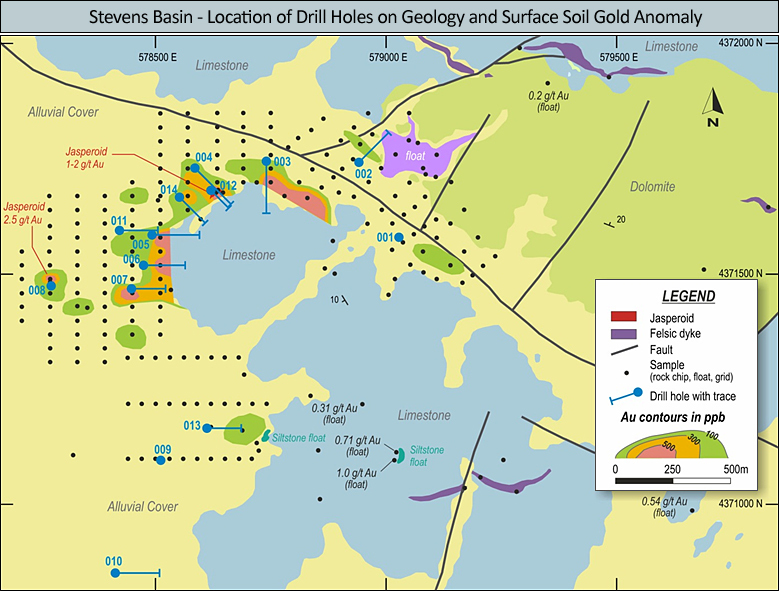 These targets are based upon the results of the soil sampling completed during Q2, 2011 and have been integrated with existing geophysical interpretations and the results of this first phase of drilling. The information herein that relates to Exploration Results is based on information compiled by Mark Dugmore B.App.Sc, MSc, who is a Member of The Australian Institute of Mining and Metallurgy. Mr. Dugmore is employed by Navaho Gold Ltd.
Mr. Dugmore has more than five years experience which is relevant to the style of mineralization and type of deposit being reported and to the activity which he is undertaking to qualify as a Competent Person as defined in the 2004 Edition of the 'Australasian Code for Reporting of Exploration Results, Minerals Resources and Ore Reserves' (the JORC Code). This public report is issued with the prior written consent of the Competent Person(s) as to the form and context in which it appears. Andy Wallace is a Certified Professional Geologist (CPG) with the American Institute of Professional Geologists and is the Qualified Person under NI 43-101 who has reviewed and approved the technical contents of this news release. This release contains forward-looking information and statements, as defined by law including without limitation Canadian securities laws and the "safe harbor" provisions of the US Private Securities Litigation Reform Act of 1995 ("forward-looking statements"), respecting drilling, and Columbus Gold's, and Navaho Gold's general exploration plans. Forward-looking statements involve risks, uncertainties and other factors that may cause actual results to be materially different from those expressed or implied by the forward-looking statements, including without limitation the ability to acquire necessary permits and other authorizations; environmental compliance; cost increases; availability of qualified workers and drill equipment; competition for mining properties; risks associated with exploration projects, mineral reserve and resource estimates (including the risk of assumption and methodology errors); dependence on third parties for services; non-performance by contractual counterparties; title risks; and general business and economic conditions. Forward-looking statements are based on a number of assumptions that may prove to be incorrect, including without limitation assumptions about: general business and economic conditions; the timing and receipt of required approvals; availability of financing; power prices; ability to procure equipment and supplies including without limitation drill rigs; and ongoing relations with employees, partners and joint venturers. The foregoing list is not exhaustive and Columbus Gold undertake no obligation to update any of the foregoing except as required by law.